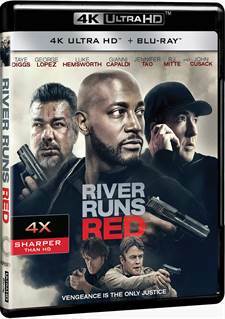 Download River Runs Red in Digital HD from the iTunes store. River Runs Red images are © Cinedigm. All Rights Reserved. Racial profiling is an issue that seems to be plaguing this country more and more in the past few years. Young, male minorities end up on the wrong side of an argument and are senselessly killed when a person in authority pulls a gun unnecessarily. We have seen numerous news reports about it happening and several films based on this type of tragedy in the past few years. 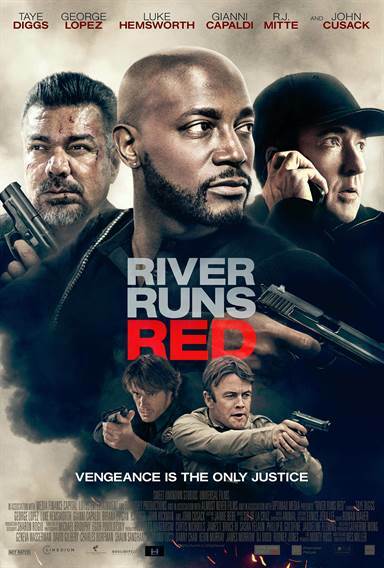 River Runs Red is one of the latest movies to tackle this heavy material. Directed by Wes Miller (Prayer Never Fails) the 4K combo pack is now available for purchase. Charles Coleman Sr. (Taye Diggs; Rent) was a young father trying to better himself and be a good example for his son. Fast forward over fifteen years and Coleman is now a successful judge while his son is about to enter the police academy. On his way to his first day CJ (Joseph Belk; Prayer Never Fails) is pulled over by two white police officers and when he reaches into the back seat to get his ID Officer Von yells "gun!" and both officers start shooting CJ. When they realize their mistake it is too late. CJ is dead and they end up planting evidence to exonerate themselves of any wrongdoing. Coleman, however, doesn't believe their story and asks his friend Horace (John Cusack; Grosse Point Blank), who is also a police officer, to investigate on his own. What Horace uncovers is that one of the cops involved in the shooting has a less than stellar past and has been involved in a similar incident before. It is then that Coleman teams up with the other grieving father, Javier (George Lopez; The Adventures of Sharkboy and Lavagirl 3-D), to seek revenge on the men who killed their sons. With a good cast, I expected more from this movie. Diggs is usually decent and he solid in this film. Cusack is rather stoic but it's a fine performance from him. Lopez shows some strong emotion and plays the part of the grieving father well. Unfortunately, newcomer Jennifer Tao, who plays CJ's mother, is rather the weak link in all of this. I'm not sure if the language barrier is part of the problem but her performance is distracting. It's also a little difficult that CJ grew up to look the way he does with an African American father and an Asian mother. You have to suspend belief a little for this one. While this movie is presented in 4K high definition video I'm not sure it needed the upgrade. The black tones seem to become a bit grainy and muddy in places which can be a little distracting. The DTS-HD Master Audio 5.1, on the other hand, is excellent quality that showcases both the dialogue and the soundtrack to their fullest. Somewhat disappointing is the lack of extras in this combo pack as think this is one film that would benefit from cast and crew interviews. The subject matter is so topical and controversial that it would have been interesting to hear why the cast and director chose this project. The subject matter of this movie is relevant and timely and it once again shines a light on an ugly problem we have in this country. However, the execution leaves a lot to be desired including fight scenes that made me roll my eyes. I'm sure anyone who lost a loved one to what they believe is racial profiling will find this film hard to watch for different reasons than I did and I'm glad the subject matter is once again in the spotlight but sadly this movie leaves a lot to be desired.